Four decades have passed since Los Lobos released their debut album, "Just Another Band from East L.A." Since then they’ve repeatedly disproven that title - Los Lobos isn’t “just another” anything, but rather a band that has consistently evolved artistically while never losing sight of their humble roots. These triple-Grammy winners have been influenced by rock and roll, Tex-Mex, country, folk, R&B, blues, brown-eyed soul and traditional Spanish and Mexican music such as cumbia, boleros and norteños. Get ready to dance to "Don’t Worry Baby," "The Road to Gila Bend," "Will the Wolf Survive?," "Maricela" and, wait for it, "La Bamba" plus many, many more great songs. 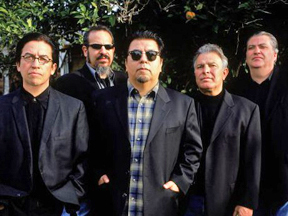 Three decades, two more Grammys, a worldwide smash single (“La Bamba”) and thousands of rollicking performances across the globe later, Los Lobos is surviving quite well, and still jamming with the same raw intensity as they had when they began in that garage in 1973. Their new album, "Gates of Gold" is out and getting rave reviews. Get a copy signed at Bull Run. Ten years ago, on their 30th anniversary, Rolling Stone magazine summed up that distinctive, diverse and spontaneous Los Lobos aesthetic perfectly: “This is what happens when five guys create a magical sound, then stick together for 40 years to see how far it can take them."